Goal: Clone the Pink Flamingo ( ), and mutate it into a Green Flamingo ( ). First, quit running The Sims. For some people, this might be the hardest part of the entire process, but rest assured that it's necessary, because Transmogrifier can't open all the files it needs while The Sims is running. Never run The Sims and Transmogrifier at the same time: always quit one before running the other! Note that Transmogrifier tells you the path name of the selected object file, ".\gamedata\objects\flamingo", and it says that "The selected file is Read-Only. Clone to modify." There is a total of 1 object in this file (just the flamingo), but other object files contain several objects. Press the "Edit Object..." button to pop up the Edit Object dialog. The "Language" menu lets you select the language in which to display the strings. You can view or edit the strings in any of the languages The Sims supports. Note that Transmogrifier again tells you that the object file is Read-Only, and can't be changed. So you can't edit the text fields, but you can read what they say, and change the language setting. Note that the Pink Flamingo is a Single Tile Object, and that it only has one graphical state: "TransmogrifierGlossary.htm#128: flamingo draw group". You can change the rotation and zoom with the sliders. There are three zoom levels (small/medium/large), and there are four rotated views. Since the flamingo is bi-laterally symmetrical, the game flips two images of the even rotations to draw the odd rotations, so it only needs sprites for two opposite rotations. Not all objects are symmetrical, though. Some objects are not symmetrical at all (requiring four images for all four rotations), others like the flamingo are bi-laterally symmetrical (requiring two images for two opposite rotations, flipped to make the other rotations), and some are even radially symmetrical (requiring only one image for all rotations, flipped to make every other rotation). The Clone Object File dialog asks you for a unique Object File name. It also asks for a Magic Cookie number, which defaults to zero. And it allows you to select the Objects in the Object File to clone. Transmogrifier automatically makes up a default unique Object File name by appending six random digits, and incrementing the number until the file name is unique. The file name in this example is "flamingo813554". Your new object file name will probably be different, but you can change it to any name you want that's unique. A Magic Cookie is a unique 16 bit number that is assigned to each object producer (a person or organization creating new objects). The purpose is to ensure that all objects created by different people have unique identifiers. Magic cookies are free for the asking, while they last. You can get one at the Magic Cookie Registry. Type your magic cookie into the "Magic Cookie" field of the Clone Object File dialog, and Transmogrifier will remembered it in the registry for later. Please leave it zero, if you don't have one. Some Object Files contain many different objects, and you might want to clone all of them, or just one (like the sets of flowers). Multi Tile Objects, like the hot tub, are composed of a Master Object and a set of Slave Objects, but they're treated as one for your convenience. The flamingo object file has only one single tile object: the flamingo. You must select at least one object and enter a unique file name, in order to clone an object file. Otherwise the "OK" button will be disabled, and the messages on the right will tell you what you need to do to enable it. The defaults are acceptable for the flamingo, so just go ahead and press "OK". After you press the "OK" button, the "Cloning Progress" window will pop up, and display the ongoing progress of cloning, as well as a bunch of cryptic progress messages. Once the cloning process is complete, the progress meter turns into an "OK" button, which you can press to dismiss the window. When you go back to the main Transmogrifier window, notice that the new file name "flamingo813554" is added to the list, and it is automatically selected for your convenience. You can see that it worked, because now it says that "The selected file is Editable." Now it's possible to edit the object! Press the "Edit Object..." button to bring up the Edit Object dialog, and notice that the text fields are editable now. First, change the name of the object from "Pink Flamingo" to "Green Flamingo". Next, lower the price, since green flamingos are so ugly and worthless. Finally, type in an amusing product description, to trick people into buying it! Once you're done, press the "OK" button to save your changes and get back to the main Transmogrifier window. Now that you've changed the name, price and product description, it's time to export the sprites, so you can edit them in another program. The "Export Whizzer" has many options to choose from, that control how it imports and exports sprite images. In this tutorial, we are just going to change the colors of the flamingo sprites, not their shapes. So you won't need to change any of the options, because the default settings do what you want. The "Just Change Colors" box should be checked, so Transmogrifier will preserve the Z buffers and Alpha channels in the object file, and let you change the sprite colors. The Z buffers define the depth of each sprite pixel from the camera, and the Alpha channels define the transparency of each sprite pixel. Changing the shapes of sprites is more complicated, and that will be covered in another tutorial. It involves editing the Z buffers and Alpha channels (which is tedious), or having Transmogrifier generate them automatically (which is low quality). But as long as the "Just Change Colors" box is checked, Transmogrifer will only export the color images for you to edit, preserving the shape of the original sprites. The "One Zoom, One Channel" radio button should be selected, so Transmogrifier will save you from having to make all three zooms of each sprite. It will automatically generate the two smaller zooms from the largest one. Selecting the "All Zooms, One Channel" radio button will cause Transmogrifier to export images for all three zooms, which you can edit in full detail. There is slight loss of image quality when Transmogrifier scales the images down, when automatically generating small zooms. So if you're picky about how the smaller zooms look, export all zooms and touch them up yourself. One check box that is always available is the "Compress Bitmap Files" option (checked by default). It controls whether the exporter writes out run length encoded BMP files (which are smaller and use less disk space, but may confuse some image editors), or uncompressed BMP files, which use much more disk space. You should probably leave it on by default, unless compressed bitmaps cause a problem, since there is no loss in image quality when the images are compressed. Another check box that is always available is the "Create Sub Directories" option (checked by default). controls whether the exporter creates a bunch of sub directories to organize the many BMP files that it exports. If it's checked, the exporter automatically creates a tree of sub directories in the file system wherever you export an object. If it's un-checked, all of the BMP files are written into the same directory. After you press the "OK" button of the "Export Whizzer" dialog, a standard "Save As" dialog pops up, to prompt you for a file name to export the object. The file that it exports has an ".XML" suffix, since it's a text file of XML (eXtensible Markup Language) that describes the object and points to all the BMP files. This XML file allows the importer to read all the other bitmap files back in, without asking you any stupid questions you already answered. After you press the "Save" button, the "Exporting Progress" window will pop up, and display the ongoing exporting progress. Once the exporting process is complete, the progress meter turns into an "OK" button, which you can press to dismiss the window. Now, go back to the Windows desktop, and explore the directory where you exported the XML file. You will notice a text XML document called "flamingo813554.xml", that ties all the BMP files together, and records additional information about the exported object file. You can double click the XML file to view it as an outline in Internet Explorer, or view it in any text editor. There's no need to look at it or change it, unless you're curious or up to something sneaky. You will also notice a directory whose name begins with the first part of the XML file name: "flamingo813554_sprites". This directories contains BMP files from the sprites used by the object. The "flamingo_sprites" directory contains a sub directory for every sprite of the object. The flamingo is simple and doesn't have any animation or other graphical states, so there's only one sub directory for the one sprite ("flamingo813554_sprites\sprite0128"). Since we only exported the large zooms, there are only large images in the directory ("*_large_*_*.bmp"). Since the flamingo is bi-laterally symmetrical, there are two images for the two opposite rotations, ("*_*_back_*.bmp" and "*_*_front_*.bmp"). Take a look at the pixel channels ("flamingo-graphic_large_front_p.bmp" and "flamingo-graphic_large_back_p.bmp"). In this tutorial, we just used to Hue/Saturation control to change the colors of 8 bit indexed color sprite images. But if you want to paint details into the image, or apply color to specific parts of the image, you will need to convert the bitmaps to full color 24 bit RGB images. Converting the images to RGB will make it much easier to edit the colors in the image, since many drawing tools and effects only work on full color images. Most paint programs can easily convert an 8 bit indexed color palette image into a 24 bit full color RGB image. In Photoshop, pull down the "Image" menu, go into the "Mode" submenu, and select the "RGB Color" item. In Paint Shop Pro, pull down the "Colors" menu, go into the "Increase Color Depth" submenu, and select the "16 Million Colors (24 bit)" item. Now you can save the images as full color 24 bit RGB BMP files, and Transmogrifier will automatically make an optimal color palette and internally convert them to 8 bit images for you. Once you're done editing the images, don't forget to save them all back to the same files where they came from! Once you press the "Open" button of the Open file dialog, the "Import Progress" window will pop up, and the importer will read in the XML file. That tells it the names of all of the BMP files that it tries to import back in, generating the smaller zooms and color palettes as necessary. Luckily for you, it remembers all the exporter settings in the XML file, so it can go ahead and import everything without quizzing you. The "Import Progress" window pops up and displays the ongoing progress of the import process. Once the importer is finished, press the "OK" button on the "Import Progress" window to get rid of it. But first you might want to scroll through the diagnostic output to see if there were any errors or warnings. Now you can finally view the object to see if it worked! Press the "View Object..." button on the main Transmogrifier window, to pop up the "View Object" dialog, and take a look at the various zooms and rotations. The flamingo has only one graphical state, but for objects with more states, you should check out all the different zooms and rotations of all the different states. The grid shows you where where the object will appear on the tile. You can click on the picture of the flamingo to change the background from white to black and back again. Notice how the anti-aliased edges blend into both the white and black backgrounds without any unsightly fringes or jaggies. There are some other controls for adjusting the offsets and flip flags of the draw groups, which will be explained in a later tutorial. Now that you've cloned the pink flamingo and changed its color to green, it's time to test it out in the game! But first, make sure to quit Transmogrifier before starting The Sims, since they can't both open the same files at the same time. Select a family and go into buy mode. Click on the decoration category icon (a hanging picture frame). The green flamingo's catalog icon should show up near the beginning of the product list, since it's so cheap, and the list is sorted by price. Click on the green flamingo icon (the pink one should still be there, unchanged), and look at the catalog description and the price, to make sure they're right. Now drag a new green flamingo out into the yard, and place it somewhere on the ground outside. It will be tinted red when you're not allowed to place it, and you can only place it outside on the terrain of the first floor. Hopefully you also have enough money to afford it! 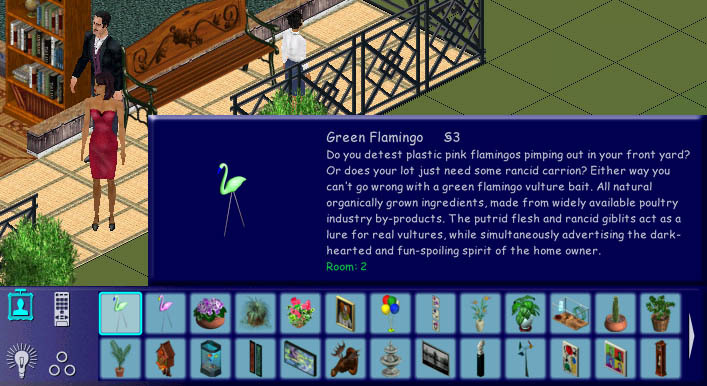 Place a green flamingo nearby your Sims, and see how your family reacts! They might walk over to it and express their approval or disapproval by displaying the speech icon, which should now be green instead of pink. Now check out the different zooms and rotations! Whether or not the Sims like an object depends on their personality, as well as the cost of the object. So don't feel bad if they reject the first custom object you made for them by hand. Some Sims are just fickle, and will never appreciate all the hard work you've gone through to make them a nice inexpensive green flamingo. Next time you can make them an extremely expensive golden flamingo, and see if they like that better. Last but not least, here are the most important instructions of all: Be creative, have fun, stop whining, share your creations, give credit to the original artists, and please play together nicely!